Cool and comfortable! Colourful elastic fabric is cleverly woven together to create a stretchable show that no only looks great but moves comfortably with your foot. Thick, skid-resistant, padded sole provides cushioning with every step. 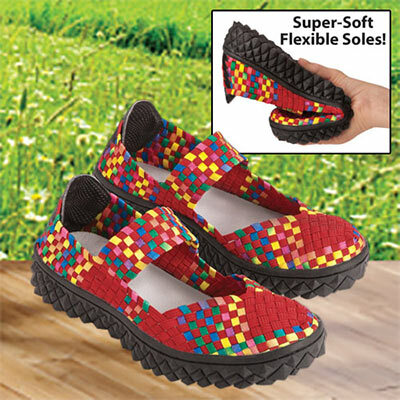 These Comfy Woven Mary Janes feature slip-on design with heel pull-strap. Imported. Hurry! Quantities are limited!